TM-Town matches your document's text to a translator's experience. Get our tips on finding, communicating with, and hiring professional translators. 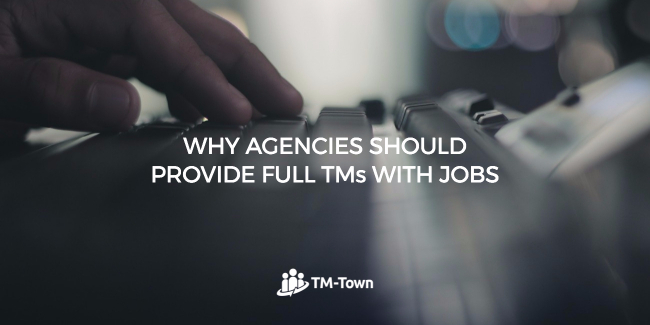 Agencies often refuse to deliver a full TM with a job, preferring to insert 100+% hits only or perhaps the highest TM hit into the xliff file delivered to the translator. This short article explains why this practice is detrimental to all involved. Agencies are often reluctant to release a full TM, feeling that it could be ”stolen” while many a PM is simply not aware that inserted target text as mentioned above is a poor substitute for a full and comprehensive TM. The most common problem is that, where the agency only inserts 100+% hits, many target segments are therefore left empty. Yet if the agency were to insert the highest fuzzy TM hits, many key words might occur in the inserted target text. So you might think that inserting the highest fuzzy hit would be satisfactory for all but unfortunately, this is not the case as the highest fuzzy hit may not contain the key words or phrases that the translator needs. But that does not mean that the same source key words and phrases and their translations are not present in the full TM. Agencies and PMs would do well to pause here and carefully consider this. The following image of an English text with a pseudo translation (English words spelt backwards) exemplifies this point. I can assure the readers that “cat” was indeed previously translated and is in the TM as “tac” (cat spelt backwards) but it has not been inserted in the following case as only 90%+ fuzzy matches were provided with this xliff and our segment (3) did not qualify. Perhaps it is quickly worth saying what I mean by key words as “cat” is provided as a simple, but rather unimaginative one. If we leave aside creative marketing material where the use of synonyms is often encouraged, most clients want consistency. They don’t want a keyword in the source text to be translated as “appraisal”, “evaluation” and “report” to give a simple example that everyone can relate to. Or to give a more technical example, it is generally undesirable and confusing for the reader if we refer to the same object as a “pipe”, “hose” and “tube”, especially where we may need to use two or more of these words in our translation to differentiate between two or more similar objects. So a “pipe” should always be a “pipe”, a “hose” should always be a “hose” and a “tube” should always be a “tube”, no matter who is translating on this occasion. Arbitrary choices too come up far more often than an agency or its PMs might imagine. It can involve the spelling of certain words e.g.” travelling” vs. “traveling”, a hyphen e.g. “work-place” vs.“workplace”, word order e.g. “a 55 cm diameter wheel” vs. “a wheel of 55 cm diameter”, whether to translate a proper noun or not e.g. “Lac de Neufont” or “Neufont Lake” etc. and such questions cannot always be settled by googling as both versions will of course come up in the search results. 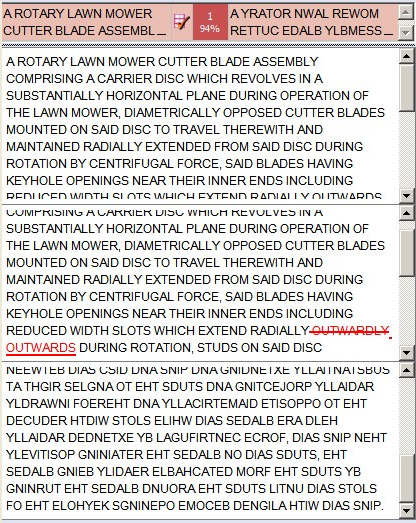 Reference material delivered with the job does help but this in turn means either aligning PDFs or DOCs beforehand, and we all know how difficult and time-consuming that can be, or checking the source language documents to see if the word has occurred in the past and then looking through the corresponding target reference language material in roughly the same location to see what the translation was on a number of occasions. Another less common but just as troublesome problem sometimes occurs when a proof-reader is given a bilingual file without the TM that the translator had at his/her disposal while translating. In the somewhat idealized screenshot below, the proof-reader can see that the translator had a 94% hit from their TM when translating the segment. But the proof-reader cannot see what the difference is between the original TM entry and the translated segment to proofread. So it is like looking for a needle in a haystack to check that the modification of the segment has been made correctly by the translator. The changed source text is clearly marked - in red with strikethrough for deletion and underlined for additions - and the proof-reader now knows exactly what needs to be checked in the target text translation. This is especially important to translators/proofreaders when agencies say to you “a job of 10,000 words but only 100 words have been changed. It remains to know which ones! TM-Town makes finding specialized translators easy. In fact, it's as easy as copy-and-paste. Spain Posted 6 months ago.